Cozi Corner Self-Catering Accommodation - Queenstown Accommodation. Your comfort is our goal. We have created a restful retreat that you can think of as your home away from home when you’re in Queenstown. Cozi Corner offers services for any traveler whether you’re on business or your journey is for pleasure. When you plan your visit, consider Cozi Corner for your stay. It is the aim of Cozi Corner to offer affordable, quality accommodation, with as many home-comforts as possible. Cozi Corner Self-Catering Accommodation consists of three air-conditioned self-catering cottages, each with its own TV and all DSTV channels. Our cottages are serviced daily, have their own en-suite as well as private entrances. Bedrooms are carpeted for added comfort and warmth in winter. Please note that a non-smoking policy apply to all Cozi Corner cottages, but guests are most welcome to make use of the under cover patios in front of their cottage. Please note that for security reasons, we only allow paying guests on the property. Why book at Cozi Corner? 50+ reviews with a 100% average rating. Best value for money in Queenstown. DSTV Premium (more than 100 Channels). 74cm Plasma screen TV's & Decoder. The two sleeper room has as twin/king bed and en-suite bathroom with shower only. It has it's own kitchen with under-counter fridge, 2-plate hob and microwave. The bedroom is air-conditioned and has a 74cm flat screen TV, full DSTV and free WiFi. Overlook the garden and pool. A maximum of two guests can be accommodated in this unit. The Two Sleeper Double Room has a double bed and en-suite bathroom with shower only. It has it's own kitchen with under-counter fridge, 2-plate hob and microwave. The bedroom is air-conditioned and has a 74cm flat screen TV, full DSTV and free WiFi. Overlook the garden and pool. A maximum of two guests can be accommodated in this unit. A spacious unit with a twin/king size bedroom with en-suite bath/shower. A dining/seating area with sleeper couch. Fully equipped kitchen, air-conditioned and carpeted bedroom, has a 74cm TV with full DSTV and WiFi. Overlooks garden and pool.A maximum of five guests (three adults) can be accommodated in this unit. Furnished cottages with equipped kitchens comprising of a fridge, 2 plate hob and microwave. Percale linen, towels, coffee and tea provided. Pillow-top beds for your comfort. Safes in each cottage for valuables. 74cm LCD TV's with full DSTV (all channels). Air-conditioners, gas heaters, ceiling fans and electric blankets. 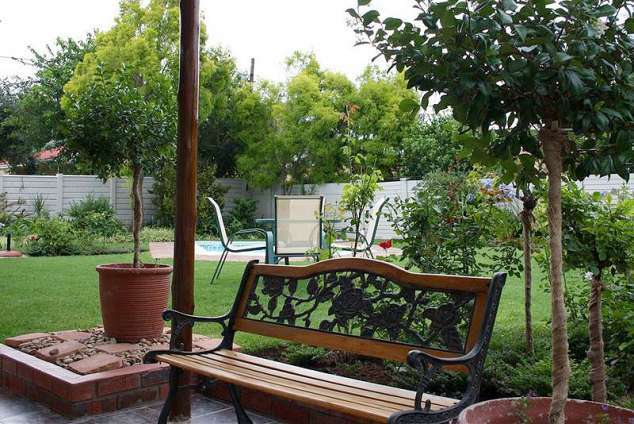 Swimming pool & braai facilities (WEBER). The attractive town of Queenstown is known for its friendly locals, climate and roses. The town lies on the Komani River at the foot of the Hangklip Mountain, and is an ideal stopover for guests travelling to the Wild Coast or Karoo Heartland. Queenstown also provides plenty of activities for the outdoor enthusiast, including hiking trails, fishing, mountain biking and canoeing. The town further offers an 18 hole golf course and a casino for guests to enjoy, while the Bongola Dam is a great place to enjoy a picnic and water sport. The reserve is situated on the slopes of the Madeira Mountain, which overlooks the town from the west and provides panoramic views of Queenstown and its surrounds. The species of game roaming the reserve includes to name few, Eland, Gemsbok, Kudu, Blesbok, Springbok, Ostrich, Zebra, Indian Water Buffalo, Wildebeest, Rhinoceros and Giraffe. The reserve is also home to the indigenous Aloe Ferox, which is a magnificent sight in winter when it is fully clad in scarlet. In summer, the tamboekie thorn (Erythrina acanthocarpa), also known as “wag-‘n-bietjie” – as its hooked thorns make progress difficult, which is unique to this area, adds its colour to the many species of acacia which are covered in yellow flowers. Game drives are welcome and the reserve also has a lapa where functions can be hosted. The Reserve is open daily throughout the year in daylight hours. The original part of Queen’s College in Berry Street, which in autumn is a magnificent sight in its mantle of Virginia creeper, is another reminder of the town’s proud heritage. Queens College is one of the oldest schools in South Africa and has been declared a national monument. 348 page views since 18 Jun, 2018.